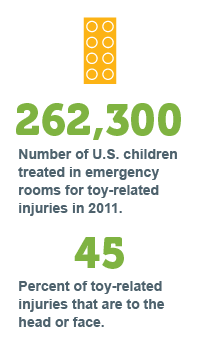 More than a third of all toy-related injuries are to children 4 and under. Safe Kids works closely with the U.S. Consumer Product Safety Commission (CPSC) to ensure that unsafe toys do not make it into the hands of kids or onto store shelves. Safe Kids advocates for CPSC to have full authority and resources to deal with unsafe toys. Safe Kids also produces a twice-monthly newsletter to inform parents of any recent recalls. Sign-up here to receive these news alerts. In addition to our work with the CPSC, Safe Kids works with other consumer organizations to advocate for the removal of rare-earth magnets from the marketplace. We put together a comprehensive case in favor of an involuntary recall. The powerful magnets, when swallowed in multiples, can cause serious injury to a child’s gastrointestinal system.